Lauren Moffatt and partner Rob Pepin spent their first two seasons in business sewing samples aboard a 31-foot sailboat docked on the Hudson River. Since then, the pair have expanded the operation into a sunny Garment District studio, out of which they produce their vintage-inspired collection of easy, cheery ready-to-wear. 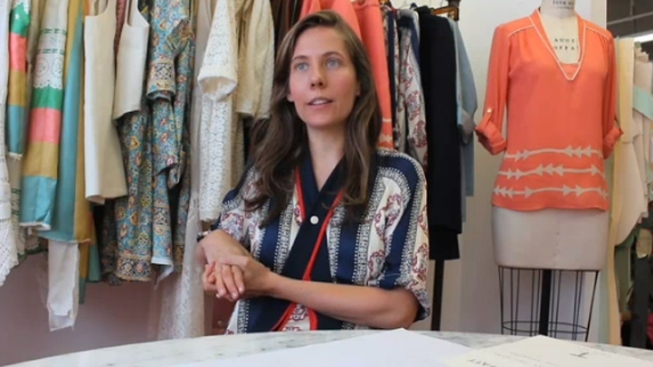 We caught up with Moffatt in her airy studio as she prepped samples for her forthcoming spring 2012 collection. "Everything's a little crazy right now," she laughed, relocating piles of bright paisley silk from a cutting table. Though the September presentations are fast approaching, we found Moffatt -- now approaching her 11th year in the fashion business -- utterly cool and composed. Here, Moffatt opens up about her love of printed fabric and the startling generosity of her fashion industry peers.